One of 2008’s best new bands was Black Tide, a band made up of teenagers! These guys are total old school heavy metal, you won’t hear any thing “nu” or alternative from them. They proudly will tell you their idols, not that you need them to — it’s obvious by listening to this album that the band was heavily influenced by the likes of Metallica (they cover “Hit the Lights” after all), Megadeth and Iron Maiden. They band is able to fuse thrash, NWOBHM with Maiden-esque solos, hard rock and catchy choruses and melodies into one fantastic package. 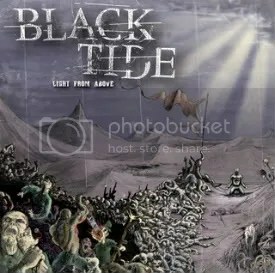 Despite being signed to a major label (which itself is a great achievement for a group of teenagers playing a classic metal style), Black Tide kinda came in under the radar. I remember reading a blurb about them in a magazine, may have been Rolling Stone and that’s actually how I came across them. I album was released at the beginning of 2008, I had owned it must of that time, but I was just lazy about reviewing it, otherwise, there’s a good chance this would have made my top ten list for ’09. This is definitely a band to watch. I can’t wait to hear something new from them because they’re only going to get better.